A Side of Roasted Cauliflower – Dinner Party Worthy? Growing up in an all vegetarian household, we ate a lot of vegetables. Afternoons snacks sometimes were bowls of freshly boiled peas, lima beans or brussel sprouts topped with butter and showered with salt and pepper. Cabbage, broccoli, beans – you name it, we ate it. And we enjoyed the pure vegetable taste of it. This roasted cauliflower recipe is an adult version of those simple vegetable sides. This recipe leaves the cauliflower bare enough for you to taste the nuttiness that comes out from the roasting with just a slight of hint of spice and tanginess. See below for what I recommend serving this with. 1. Preheat the oven to 450 degrees. Put the cauliflower florets into a big mixing bowl. Drizzle the olive oil over the florets. 2. Shower the florets with paprika, red chili powder and salt. 3. To mix the spices in well, cover the opening of the bowl (I use a plate with the eating side facing up) and shake well. 4. Line a cookie tray with aluminum foil. Spread the florets evenly on the tray. 5. Roast in the oven for about 25-30 minutes or until the cauliflower begins to look soft and golden. Turn the pieces halfway through the roasting if needed. 6. Adjust salt and spice as needed. 7. Sprinkle lemon juice over the cauliflower immediately before serving. I would definitely serve this at a dinner party. Would you? Rajat would probably tell me it’s too simple, but I disagree. The paprika and the chili powder give the cauliflower a beautiful red hew and the roasting makes it all golden. The vivid colors and the nutty, spicy taste masque how simple it is to make. And, you can make it, toss it into the oven and go about your business of prepping the rest of the dinner without any worry. I suggest serving this along with Palak Channa or Mattar Paneer as the main dish and some Daal Makhani. Nithya: Rashmi, thanks and welcome! Looking forward to checking out Delhi Belle (already love the name!). Thats a delicious gobi dish! Nithya: Stephanie, wow I definitely didn’t see that one coming! I’m so happy to see this made a passover friendly dish 🙂 You could make raita with a little sprinkle of chaat masala/amchur and red chili powder and some fresh cilantro to substitute in some flavors without the cumin and mustard seeds. I am going to have to give this a shot because I have just got into roasting cauliflower and been depressed because mine was lacking strong flavors. Nithya: Jeff, what did you use when you roasted your cauliflower? Let me know how this turns out! I make this as a side dish but it gets over as starters!! It is one awesome dish and looks so good too! Wonderful! I skipped the matzah–added parsnips into the mix, and ate it with a quinoa preparation inspired by Karina’s Kitchen. (And mentioned you over there!) I had to add my hot chili to my own to ensure my kids would try it, but 6 year old daughter loved it all. I used orange cauliflower, so it was beautifully colored. Nithya: Sounds yum! I’m going to have to have check out Karina’s Kitchen! Orange cauliflower sounds beautiful. Send me a picture! nithya, this must be the most delicious side dish ever, really simple and great side dish. The raita was simple–cilantro, whatever tomato pieces didn’t get into the quinoa, and a little salt & pepper. Added chili to all of it for me… As for pics, need to start doing that, I suppose. I am always fighting to get the food to the table without the children filling up on junk (or matzah) that I would never think to take photos of it. Indian food was my pre-Passover lunch because I knew it was what I’d miss the most, and then I got to make some! Yes, I would totally serve that at a dinner party! Most people will tell you that they don’t like cauliflower, and then when served to them roasted they are almost always a convert. I love the idea of spicing it up with chili-infused oil – nice touch. 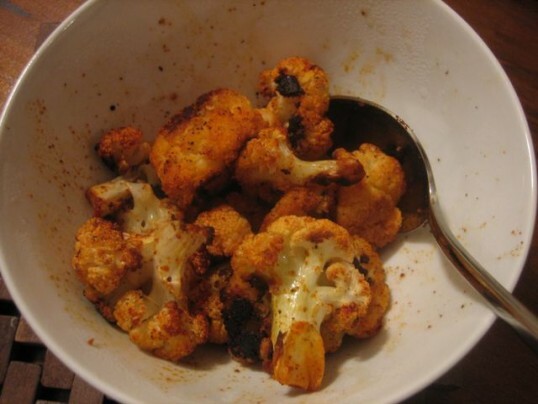 Roasted cauliflower is so good! I like the nice red colour of yours.